Thames Valley Police are appealing for witnesses after an Adderbury family were the victims of a frightening aggravated burglary. Three men knocked on the door of a property in Sydenham Close at around 10.50pm last Thursday (1st November 2018). Four people were at home at the time. A teenage boy answered the door. He was forced inside by a large man dressed in black, wearing a balaclava and gloves. The boy ran upstairs to his parents’ bedroom and armed himself with a baseball bat. He was then confronted by a second man, also dressed in black. The boy struck the man a number of times on the face, head and body, but then became aware of a knife and dropped the bat. At this point a third man entered the bedroom. Two girls in the property were placed in another bedroom, while the boy’s mother was assaulted. The teenage boy was restrained by the offenders who demanded money. They then took jewellery worn by the woman and left the property. The three offenders are all described as black men, of muscular build, wearing balaclavas and gloves. One of the offenders was wearing an orange high visibility jacket with the name of a crane company written on the front. 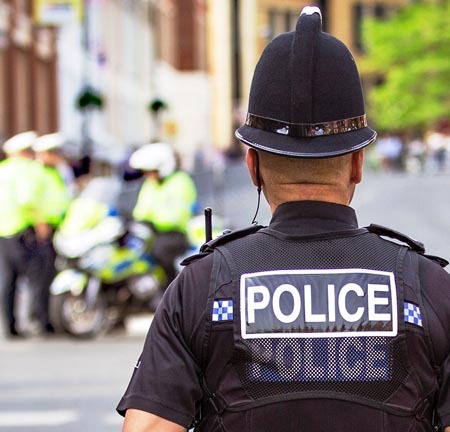 Investigating officer Detective Constable Grahame Lea, of Force CID at Banbury police station, said: “I am appealing for any witnesses who were in the area at around 10.50pm on Thursday who may have seen the men in or around Sydenham Close. At least one of the men was wearing a distinctive high visibility tabard. “In addition, I’m appealing for a taxi driver who dropped off a person in the area of Sydenham Close and would have seen the offenders to contact police. “Likewise, I am asking to anybody who has CCTV covering Aynho Road and up to Sydenham Close to contact us”. Anyone with any information about the incident as asked to call the 24-hour non-emergency number 101, quoting reference number 43180334424. Alternatively contact the independent charity Crimestoppers on 0800 555 111.